While traveling I had some free time so I spent the weekend in San Francisco. On Saturday I rented a bike and pedaled across the Golden Gate Bridge. If you know how to ride a bike that is simply the best way to see the city – you can cover a lot of ground and you can get off at any place you want to stop and enjoy the view. And there are a lot of them! I found a tourist magazine in my hotel room that recommended runners to run the Embarcadero. This was my first visit to San Francisco and it sounded like good advice. 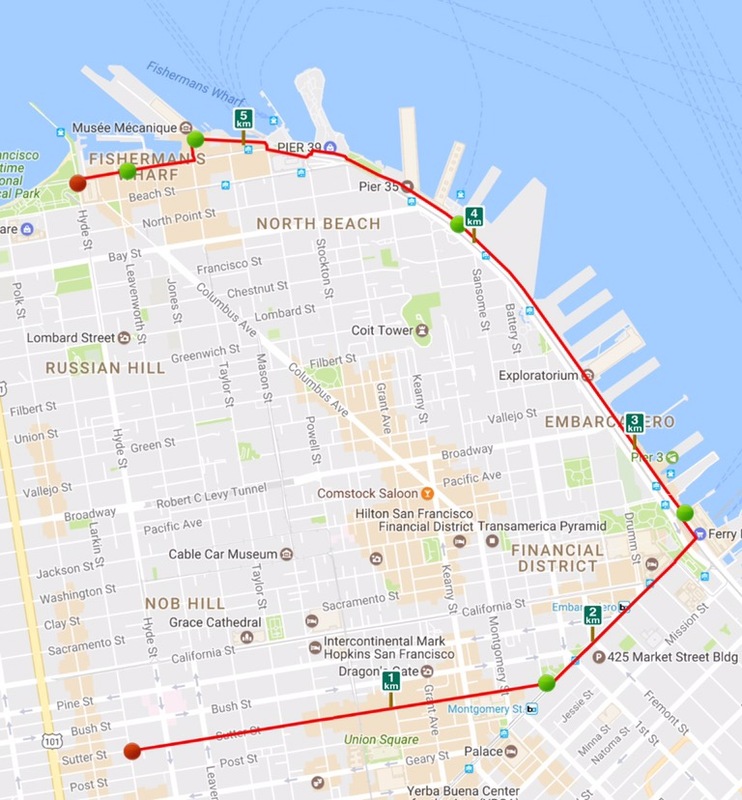 My hotel was on Sutter Street, close to Nob Hill, and after walking around in that neighbourhood it was clear to me that is no place to run unless you are used to very steep streets and hills. And I am in awe of some locals who I saw running while pushing a baby in a stroller up the hill as if it was normal (to them it probably is). So on Sunday morning I first ran down Sutter Street to the Ferry Building (many traffic lights) and then made a left onto the Embarcadero, which is a wide pedestrian walkway without side streets. Even though it was January, the weather was quite nice and the sun was shining. The magazine promised a great water front view, but that was not at all the case and I felt a bit cheated. The Embarcadero is lined with terminals and harbor buildings that obstruct your view of the water, so I did not understand the magazine’s recommendation at all. I ran all the way to the end of Fisherman’s Wharf, which offers the better views. My run also became a 10k instead of my usual 5k so from that perspective it was a satisfying Sunday morning. During my bike tour on Saturday I had cycled along Marina Boulevard on my way to the Golden Gate bridge. This is a much better place to run. Once you get to Chrissy Field Beach, nice broad paths allow walkers, runners and bikers to easily share the road and you’ll enjoy an unobstructed view of the water and the Golden Gate Bridge. So if you really want to enjoy your morning run, take the extra time to get down to the Maritime Garden and start your run there. Hope you enjoy it just as much as I did.